E’ disponibile il Programma completo del Convegno “Transformative business strategies and new patterns for value creation organizzato” da Sinergie Italian Journal of Management e SIMA (Società Italiana di Management). The transformation of a sector is usually connected with the adoption of a new technology. However, although these new technologies are often key factors, they are never enough to spur the transformations at hand by themselves. A business model that connects a new technology – or a new way of applying it – with a market need fosters important changes in a sector; this situation creates, in turn, a new combination in the process of value creation. Business models that generate transformations may concern, for instance, an increased personalization of products, processes of circular economy, the sharing economy, pay per use systems, and adaptable and agile forms of organization. 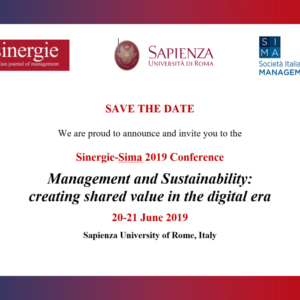 The Sinergie-Sima 2018 conference intends to focus on “transformative” business models and necessary strategic evolutions viewed as challenges for business management in the near future.